He said the government has a "greater tolerance for risk." Prime Minister Justin Trudeau addresses supporters at a Liberal Party fundraiser, in Surrey, B.C. on Sept. 4, 2018. OTTAWA — The Trans Mountain pipeline expansion project would be "dead" if it were still in private hands, Prime Minister Justin Trudeau said Wednesday. The prime minister made the remark during an Edmonton radio interview on 630 CHED ahead of a meeting with Alberta Premier Rachel Notley. "There would be no Trans Mountain expansion if it were still a private proponent doing it," he said, of the Court of Appeal ruling overturning the National Energy Board's approval of the contentious project. "So our decision to actually take on the project is the only thing that means we can still move forward with this project." Trudeau told host Bruce Bowie that the federal government has a "greater tolerance for risk" —suggesting the project has a larger safety net now than if it were still owned by Kinder Morgan Canada. 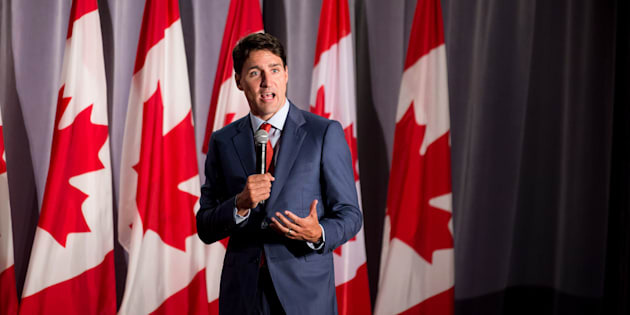 While the federal government's goal is to get Alberta's oil resources to tidewater, Trudeau said it's not the federal government's objective to make a profit from the pipeline. "Our process and our focus is on getting that pipeline built the right way so we can finally get our oil resources to markets other than the United States," he said. He said it was it "ridiculous" that Canadian oil is still mostly flowing to the United States when there are new market opportunities in Asia. "And that's why this project is in the national interest. That's why we're going to get it built." The prime minister did not offer an explanation for how the government will get the expansion project built. A Federal Court of Appeal decision last week halted construction on the pipeline expansion. In a unanimous ruling, the court said the government had failed in its legal duty to consult Indigenous peoples; and the NEB had unjustifiably excluded project-related tanker traffic in its environmental review. That same day, Kinder Morgan Canada shareholders voted overwhelmingly in favour of selling the pipeline and the assets related to its expansion to the federal government. The government announced its intention to buy the interprovincial Trans Mountain pipeline and core assets related to the expansion project for $4.5 billion back in May. Shortly after the court decision, both Trudeau and Finance Minister Bill Morneau reaffirmed the government would need some time to review the ruling before it decides on its next steps. In Ottawa, the House of Commons' natural resources committee held an emergency meeting Tuesday where Tory MP Shannon Stubbs tabled a motion to have two senior ministers answer questions this week about the government's handling of the pipeline expansion project. Stubbs' motion was voted down by Liberal MPs who hold a majority on the committee. The federal government could decide to re-do consultations with Indigenous peoples, appealing ruling to the Supreme Court of Canada, or drop the expansion project altogether. But Trudeau told 630 CHED he views the court ruling as a roadmap to guide the government in getting the expansion project built. When asked if Ottawa would invoke the notwithstanding clause to ensure the pipeline expansion gets built, Trudeau suggested it's not in his government's interest to use "tricks" because that kind of action sows unfavourable political and economic effects. He explained "using a legislative trick may be satisfying in the short term, but it would set up fights and uncertainty for investors over the coming years on any other project." The notwithstanding clause has been raised by some experts, including former Quebec Liberal leader Jean Charest, as a way the government could circumvent the Federal Court of Appeal's ruling. But that legislative route would be "problematic," according to a McGill law professor. Evan Fox-Decent explained last week that the government's legal duty to consult Indigenous peoples is not enshrined in the Charter of Rights and Freedoms — it's anchored in section 35 of the Constitution Act. The Charter allows two ways for governments to go around any limits it imposes: by invoking the limitations clause or notwithstanding cause. But because the duty to consult Indigenous peoples is not in the Charter, invoking the notwithstanding clause to sidestep the court would not make any sense. "So it is far from clear where the federal government could acquire lawful legislative authority to avoid the duty to consult the FCA says it owes to First Nations," Fox-Decent said. Following his radio interview, Trudeau told reporters at an event at the Northern Alberta Institute of Technology's Productivity and Innovation Centre that he understands the frustration the province's oil workers may be feeling towards his government. "We would like to see shovels in the ground as quickly as possible," he said.